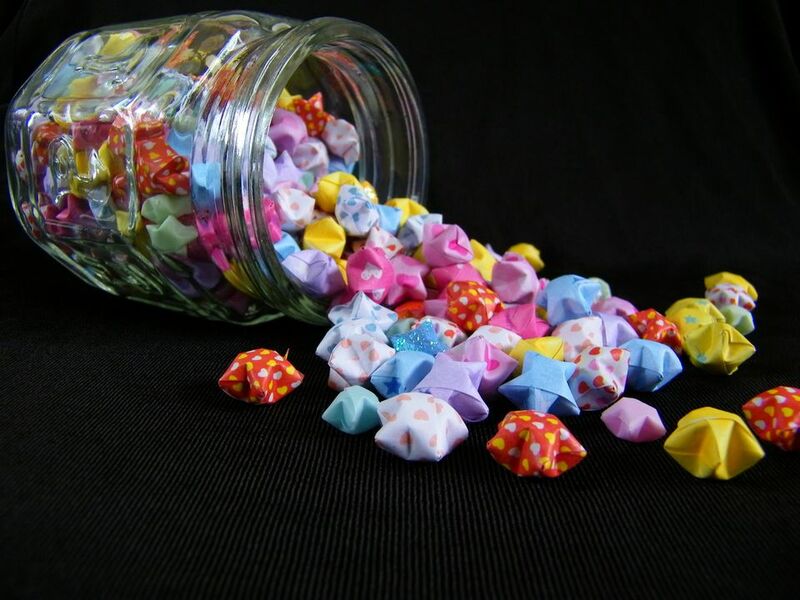 These cute little 3d stars are surprisingly easy to make and can be used in many ways. Thread a few onto a piece of string or ribbon to make a garland, thread a couple onto a piece of wire to make jewelry or place a few into a glass vessel to use as a decoration. The stars are formed from a single strip of paper. Decorate plain paper with rubber stamps or use pieces of scrapbooking or decorative paper. While this star is very simple to make, you may find it helpful to try it using scrap paper first to get a feel for how the star is formed. Tip: - instead of using a paper with an allover pattern, try stamping a single stamp into the center of the star. Use a small stamp and stamp the image before shaping the star. The basic shape of the star is created by making a 'knot' out at one end of the strip of paper and flattening this to give a pentagon shape. To make the knot form a loop at one end of the strip of paper. Tuck one end of the strip of paper through the loop to make a knot. Press the knot flat. Tuck the short end inside the knot (you may need to trim the end of the paper to make it fit neatly inside the knot). Start wrapping the long end around the knot, following the contours of the pentagon. Keep folding the strip of paper around the pentagon shape. Tuck the end inside, trimming the end of the three-dimensional if necessary. Now is the time to add a rubber stamp image to the center of the star if required. Start squeezing the edges of the pentagon shape to form the points of the star. Press the center of each side inward, forming the points of the star. You may need to squeeze and shape the star a few times until you have the shape you desire. It may take a couple of goes before you can create a perfect star shape. Add any embellishments required such as glitter glue or other adornments. The star is now finished! Make a few more to create a garland or unusual mobile. You can also easily adapt this to make a 3D paper heart.